Ranking near the top of the car seats we reviewed, the Cybex Aton 2 is a good option that looks great and scored above average in most of our tests. It was one of the easiest products to install using LATCH anchors and offers above average comfort and quality with soft fabric and thicker padding. We like the seat a lot, but it faces some stiff competition with similar high-end options like the Peg Perego Primo Viaggio 4-35 and the UPPAbaby Mesa earning better scores overall. Also, the award-winning Chicco Keyfit 30 performed slightly better and cost $100 less. Cybex has introduced additional colors to choose from for the Cybex Aton 2. No other structural changes have been made to the seat, so performance should remain the same. The Cybex Aton 2 is a rear facing car seat designed for children 4-35 pounds and up to 30 inches. This seat features side protectors that transfer the initial impact to the seat's shell, the shell then absorbs the energy and transfers it away from the baby. The Aton 2 has a large canopy that can disappear behind a visor. The base on the Anton 2 has a unique tensioning system for LATCH or vehicle belts. It clicks into a metal chassis on the base for strength. We have tested over 15 infant car seats for this review since its first version in 2016. This picture includes the original lineup, four of which have been replaced with new and different popular seats to replace those that have been discontinued. The next graph gives a comparison of overall scores for the car seats tested in this review, with the Cybex Aton 2 is shown in blue. The sections below provide details on how the Cybex performed during our testing process. Individual metric results were used to calculate overall scores with an emphasis on ease of installation and ease of use, as well as crash test results. The Cybex crash test results suggest it provides a better level of protection than many competing seats for the forces recorded by both the head and chest sensors in the crash dummy. While all the seats meet the minimum guidelines for crash test results, some seemed to offer an additional margin of protection with scores further from the Federal maximum of allowed G forces. 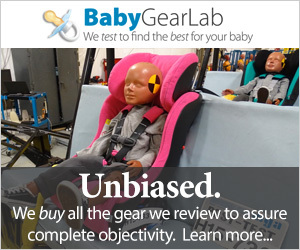 While the Cybex was middle of the pack in crash test results, it significantly exceeds Federal safety standards, and thus provides an extra margin of protection relative to half the seats we reviewed. The charts above compare the Cybex (shown in black) to the seats with the best crash test results (shown in green) based on the head and chest force sensors of the crash test dummy. The Cybex results were about average compared to other products we tested, but significantly better than Federal requirements. The Cybex has a unique and interesting side impact device located on the handle of the seat that their marketing claims will reduce or transfer the impact of crash forces to the shell of the seat. While we don't have any proof this feature works as advertised, it is an additional feature that makes the Cybex stand out. This feature can only be used if no passengers are sitting next to the seat. The seat also sports a leg prop that helps stabilize the base of the seat and can potentially decrease the amount of rotation or rebound the seat will experience in a crash (as claimed by the manufacturer). Only a few products in this review offer this feature. The design is intriguing, and physics seems to suggest it will help. The Cybex earned an impressive score of 9 of 10 for this metric tying with the Chicco Keyfit 30, and the UPPAbaby Mesa. The high for the group is a 10 received by the Chicco Fit2. The Cybex car seat came with LATCH guides that help make access to the U anchors on the vehicle more visible and easier to reach. These guides are made of plastic and essentially create a pocket for the connectors to go through, so you have better access. We liked the idea, and it does make the process somewhat easier, but the guides don't stay in place, and usually come loose from the vehicle seat, so the result is they just float around on the strap. This isn't a big deal, and you can still use them, but it is annoying, and it would be nicer if they stayed in the seat crevice. The Cybex has the push button connectors for LATCH. We think this style is easier to connect and disconnect. They work nicely with the guides and were easy to use. The straps are also easier to tighten and loosen than the competition. Overall, this seat is easy to install and secure in every car we used. The Cybex scored a 7 of 10 for ease of installation using the vehicle belt. This score is above average for the group and is arguably good enough for something you might not need to do. The high score is a 9 shared by Phil and Teds Alpha and the Peg Perego Primo Viaggio 4-35. The Cybex has a very interesting belt lock-off system that helps even the weakest parent achieve a tight and secure installation using the belt method. The lock off is relatively easy to use, and the color coded belt path makes it easy to know where to put the belt. The lock-off gets/keeps the belt extremely tight, almost too tight, and occasionally we had trouble closing it. The upside is there is no reason to struggle with the vehicle belt to get a tight fit and parents lacking upper body strength will appreciate the feature that prevents frustration during installation. This seat also has a level on the base that helps parents find the proper angle. Whether you use LATCH or the belt the level can help parents find the right fit. The little ball in the level has a tendency to catch on the inside of the casing, and we think it would work better if the ball were metal or if the entire level was the liquid bubble variety. However, it certainly better than a line drawn on the side of the seat. The lowest installation score the Cybex earned is a 5 of 10 for ease of install without the base. The high score for this group is a perfect 10 earned by the Peg Perego and the UPPAbaby Mesa. The Cybex has a European belt path system that is color-coded. We prefer the European method because we think it feels more secure with the shoulder strap wrapped around the back of the carrier. Threading the belt is easy, and we did not need a towel or noodle to install the seat correctly. This seat can be installed using the American belt path method if necessary with a belt thread across the lower portion of the carrier. If your vehicle middle seat only has a lap belt, you can still install the seat without the base. Unfortunately, this carrier doesn't feel that stable once installed. It earned the lowest score for stability in our review, tying with the Chicco Keyfit 30. The Aton 2 earned a 5 of 10 for ease of use, which is below average and only two points higher than the lowest score of 3. The buckle on the Cybex is easy to use and not as stiff as most of the competition. It is easier to release than it is to buckle, but given how difficult some other seats in our tests were (ehm, Graco) we still like it. The chest/retainer clip is similar to the Britax B-Safe 35 Elite for how much pressure it takes to squeeze the clip to unbuckle and how easy it is to slide apart, though the type of clip is different for each. The two sides mate up easily and we didn't have any difficulty using it. Tightening the harness on this seat is stiffer than most of the group. We couldn't readily tell why, but it is harder to pull the strap at the foot of the carrier and the padding on the shoulder straps causes additional trouble, and we couldn't get the harness tight enough for smaller babies. To loosen the harness there is a button at the foot end of the carrier that is under the surface of the seat and has a hard cover around for visibility. The button isn't deep under the padding and is easy to push. The base on the Cybex has an adjustable foot that can be altered depending on the angle of the vehicle seat or to assist with any discrepancy when trying to install. It is one of the easiest in the review to use and can be adjusted even after you have tightened the base to the vehicle seat. Adjusting the height of the shoulder straps on this seat required rethreading the straps by removing them from a T splitter located on the back of the seat. The straps can be detached from the splitter, pulled through the slots in the back, and then moved to a slot of a different height and reattached back on the splitter. The straps have small loops which make them harder to get on and off than some of the seats with larger loops. However, we do prefer the non-rethread adjustment options where the height can be altered with the baby in the seat and on the fly. The Cybex has three height options and one crotch strap position. We prefer the seats with more options to ensure the best fit for baby and feel the Cybex might not have enough to get the right fit for every baby. The Cybex carrier is harder to install on its base than most of the competition. For some reason, it doesn't just fall into place and instead, you have to adjust it "just so" to make it click. We struggled with it on and off and felt it could be troubling with weight in the seat and a struggling baby to keep your cool trying to get the carrier in the car. However, it does have a visual indicator that indicates the carrier is attached correctly, so at least once you manage to get it onto the base you can feel somewhat confident it is attached properly. There is a green button on the grey release button on the front of the base that indicates a solid connection. In our experience, it never gave a false positive. Releasing the carrier from the base requires depressing the green button (safety feature) on the grey release button then depressing the grey button on the front of the seat, after that you can lift the carrier off the base. You'll need to remove the front of the base then lift the seat out. The blue block on the back of the seat is a belt path thread for the seat, not a release handle like most seats. This process is more convoluted than the majority of the seats that have a release handle on the back of the carrier that doubles somewhat as a handle for lifting the carrier off the base. The handle on this seat lightly rubs the canopy when both are up. The shape of the handle is more comfortable than most of the carriers that have sharper corners. Operating the handle on the seat requires pressing the buttons on both sides located near the pivot point and rotating to the desired position. The handle has 3 available positions and must be in the carry position for driving. The LATCH anchors on the Cybex store underneath the recline foot on each side. To store or remove them the recline foot needs to be completely extended. The trailing straps from the anchors can still potentially get in the way of a proper carrier installation onto the base, so parents should be careful when installing the seat to make sure they are not present. The Cybex earned a 7 of 10 for comfort. This score is one point lower than the high of 8 earned by Phil and Teds Alpha and the Peg Perego. The Cybex has nice padding and soft fabric, but the padding does seem a little thin for something this soft. The fabric is a little like jersey knit and feels nice to the touch. Both of these factors help lead the Cybex to an overall nice fit and finish. The fabric fits the carrier well and gives it a sharp overall look. The canopy is also nice and fits the frame well. It opens and closes smoothly and looks great in either position. Unfortunately, the shell quality and durability aren't as impressive as the rest of the carrier. It seems pretty thin and not as durable as the some of the other products. It does look nice, but overall it isn't the quality we would expect from a product with this price. The canopy itself is small and not that impressive; it has a hard flip-out visor that helps provide a little more coverage, but it isn't the best. There is no peek-a-boo window, but you aren't likely to need one given that the canopy is one of the smallest in the group and doesn't really merit a secret window when you can easily see baby without one. The Cybex weighs in at 9.32 lbs which is below average for the group.The weight for the Cybex is a good one for the group and definitely didn't dissuade us in any way. In general, most of the seats lighter than this one did not score well overall and performed poorly in our test metrics, so to choose a seat solely based on weight is a mistake in our minds. Phil and Teds Alpha is a nice seat with a good weight coming in at 8.53 lbs. The Aton 2 is compatible with a few nice choices from our Full-size Stroller Review. These include the Editors' Choice UPPAbaby Cruz, and the Top Pick for Versatility award winner the UPPAbaby Vista. Both strollers are easy to use, have large canopies, and large storage bins with a weight capacity of 25 and 30 pounds respectively. While the Cybex did earn a 9 of 10 for LATCH installation, it didn't score that well in the other tests. In several of the metrics, the Cybex didn't score above average, making it a seat that probably doesn't have a best application. Other products scored better in our tests and were cheaper. Several award-winning options, the Peg Perego Primo Viaggio 4-35 and the UPPAbaby Mesa, earned more points overall with the Peg Perego offering better crash test results. With a list price of $320, it is one of the more expensive options in this review. It does rank fairly high with stiff competition, but several products earned higher scores and have lower prices. However, it is also hard to claim that it is too expensive given the price of the competition and some of our Editors' Choice picks. It simply isn't the best scoring product in its price range, which makes it not a great value. In addition, our Best Value pick, the Safety 1st onBoard 35 Air scored within 2 points of the Cybex and is almost half the price of the Cybex. The Cybex earned a respectable score in our review but didn't perform well enough in our tests to earn an award. While it has some interesting features that we like, such as the rebound leg, belt lock-off, and the side impact flip out, it didn't perform well enough in every metric. With a poor ease of use score compared to the competition, we feel the seat has a little ways to go before it meets the performance of the other products in the review to become a real contender in our side-by-side testing. Cybex makes a few different infant seats, the Cybex Aton 2 reviewed here, the Aton and the Aton Q. The Aton Q is the most advanced seat in the Cybex lineup. The Aton, is more of their basic model. The Cozy Greens Back Seat Mirror, manufactured by Cozy Greens, is just right for moms and dads wanting to keep an eye on baby from the front seat. It is shatterproof and can pivot to adjust to your needs and will secure to remain in place. It fits onto a flat base that goes on the front of the headrest. This is conveniently kept in place by two straps that fit around the headrest horizontally and vertically. A minor downfall of this is that it requires an adjustable headrest in order to attach correctly. Other than that, reviews we read seem to really enjoy this mirror and claim that it provides a much clearer reflection than many other back seat mirrors.